Four-o'clocks are lush and bushy to four feet. The tubular flowers bloom in irridescent purple, white, red, yellow and striped. Their name derives from the fact that their flowers open in the late afternoon and stay open until the next morning, except on cloudy days when they open earlier. 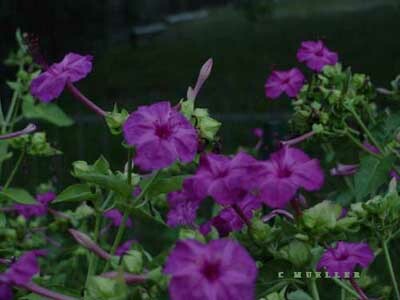 The fragrance of four-o'clocks is appealing, and is a major reason for their popularity. They also attract hummingbirds and moths to the garden.